I hope you made it to The Fall Harvest Dinner that my great blogger friends and I hosted yesterday? If you didn’t, then please rewind for a minute and check it out before you continue reading this post. You won’t want to miss the beautifully decorated fall table, tasty cocktail, yummy appetizers, scrumptious salad and side dish, soft and delicious homemade bread and rolls, and sweet dessert that was shared there. Recipes are available for each dish featured in our Fall Harvest Dinner, along with Sandra’s table setting tips, at each individual blog. Just follow the links I’ve included in that post to access them. My contribution to our dinner party was a Crusted Garlic Parmesan Roasted Chicken. 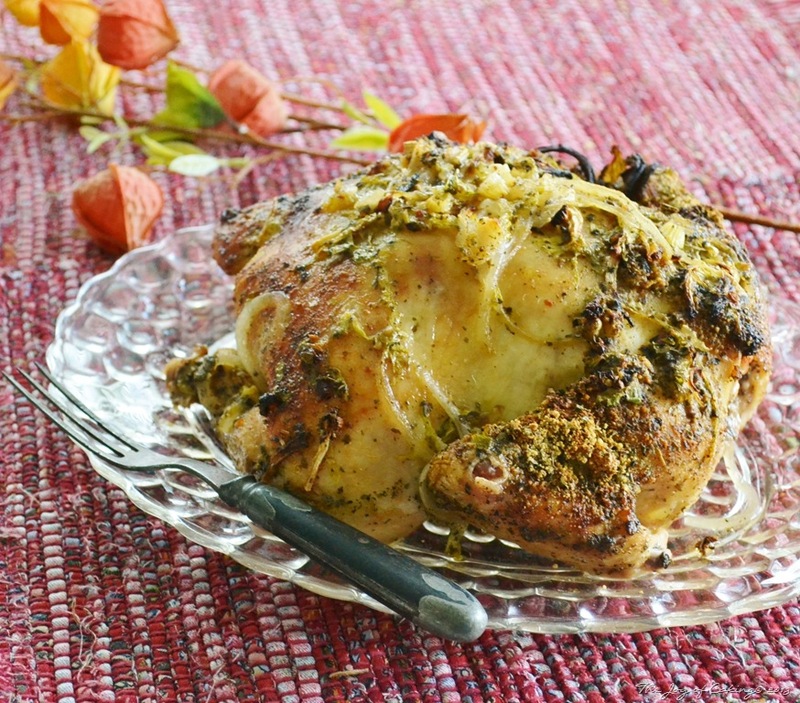 Autumn is the perfect time to start roasting meats and chicken is no exception. This is an easy dish to make and a relatively inexpensive way to feed a hungry crowd. The recipe and baking instructions come straight from the cook (hubby) in this house, not (me) the baker. Remove the giblets and discard them. Rinse and dry the chicken. 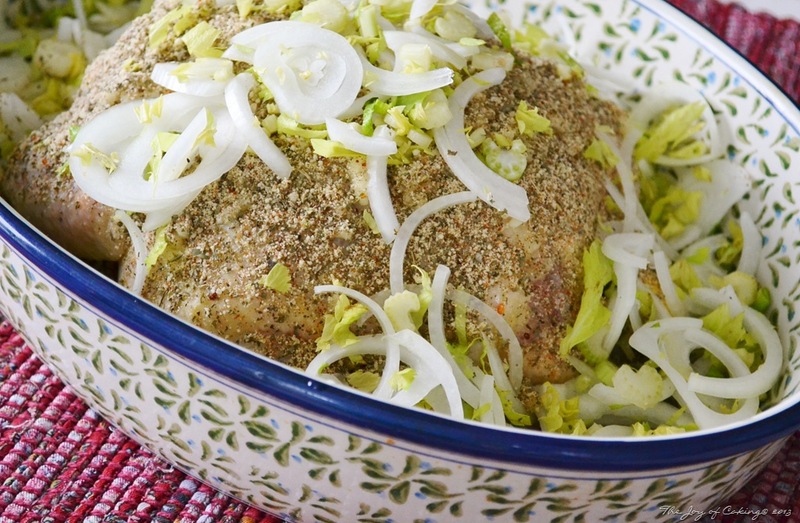 Place the chicken in a large roasting pan; drizzle olive oil, honey, and red wine vinegar on top. Crush 4 cloves of garlic and sprinkle onto the chicken. In a bowl, mix together seasoning consisting of 2 tbsp. dried basil, 1 tbsp. 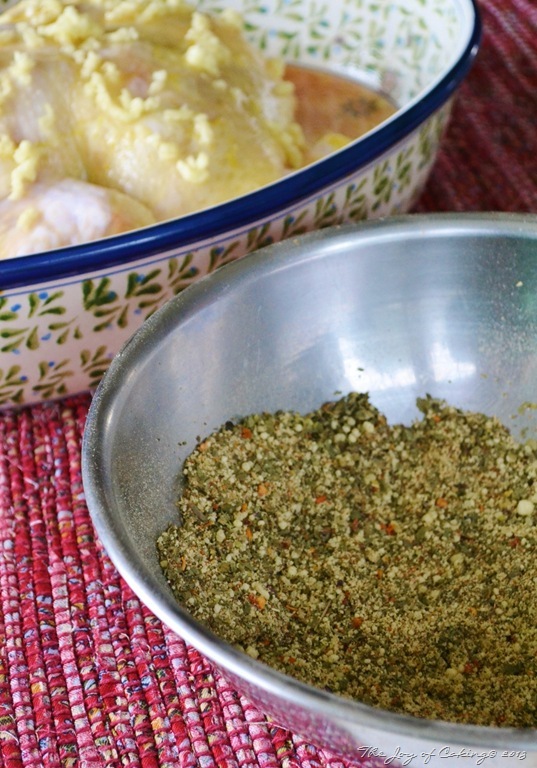 Italian seasoning, 2 tbsp. parmesan cheese, 2 tsp. five pepper spice, 2 tsp. celery salt, and 1 tbsp. of dried cilantro. 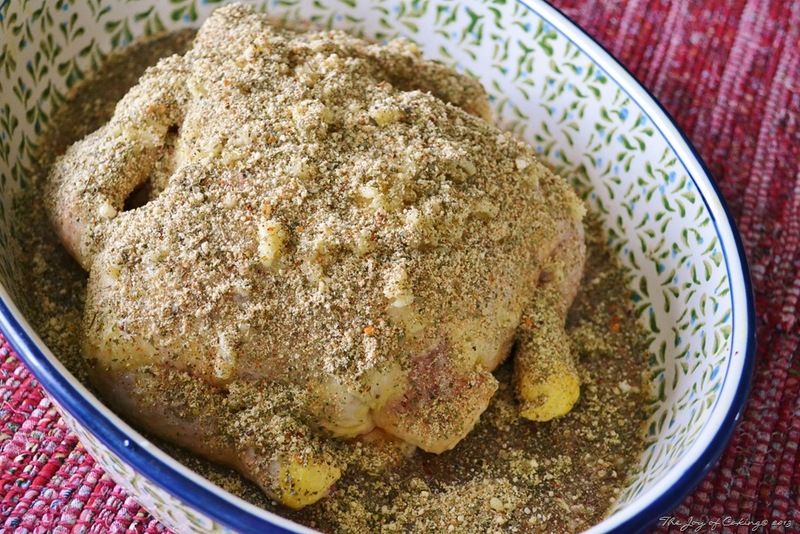 Generously sprinkle seasoning over the chicken and into the roasting pan. 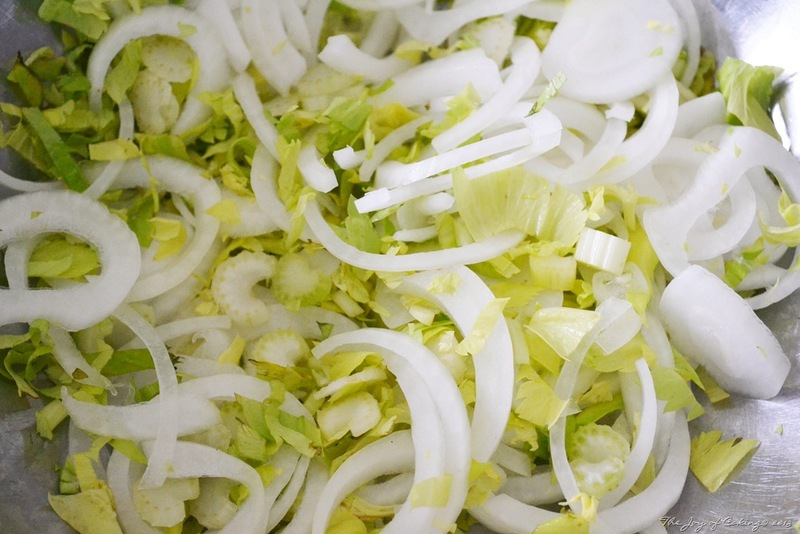 Slice one medium onion, and chop the very top of a head of celery (including the leaves). Cover the chicken with the vegetables. Fill the roasting pan 1/4 of the way full with water or chicken broth. 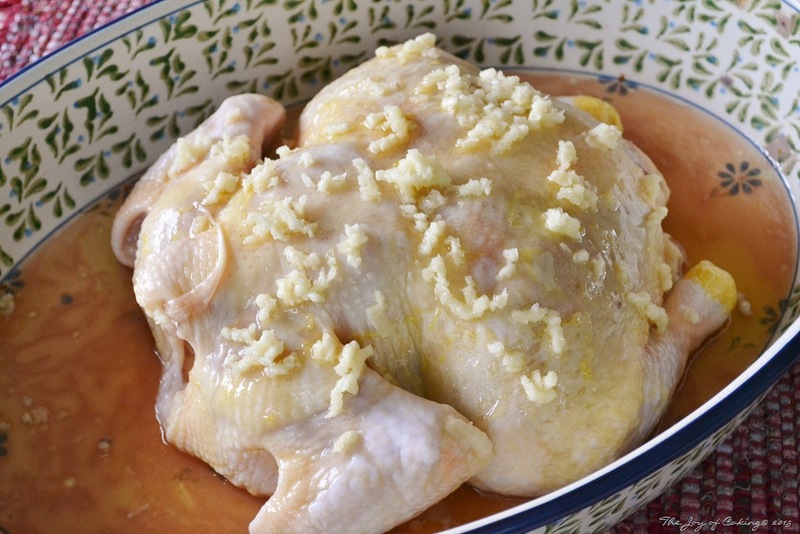 Place chicken in preheated oven and bake until internal temperature of chicken is 180 degrees. For the size of the chicken hubby baked it took 2 hours. Remove from oven and allow meat rest for about 10 minutes before removing it from the pan. This chicken is baked just like I like it. Moist inside and crusty on the outside – yum! What’s your favorite meat to roast? Beef, pork, lamb, turkey, ham, or chicken? Ten Bloggers Present – The Fall Harvest Dinner! Thanks for linking up with us. Have a fun HALLOWEEN! Yea!! Thanks for the feature – you guys rock! It was a lot of fun hosting the dinner. Sandra is already planning the decor for the cookie exchange – lol! I’ll keep you posted. Hello sweet friend. What a joy to be part of the dinner…and what a wonderful main dish you shared with us! This looks heavenly. Ryan and I both agree that we’ll be making it early next week. Thank you for sharing! I love the pamesan and garlic here! So glad you were part of the party! Let me know how the chicken turns out 🙂 Have a great weekend! This looks wonderful and I pinned it to try. 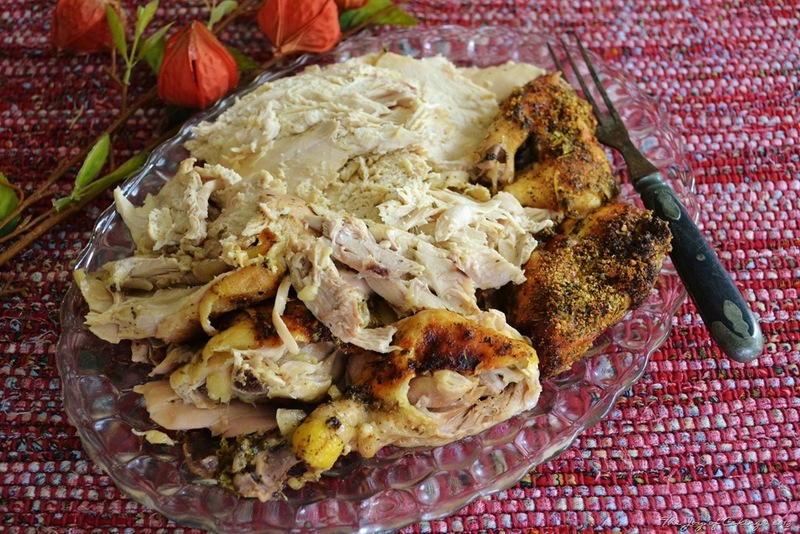 Roast chicken is m favorite dish to prepare because it gives us 3 meals plus rich stock from the carcass. Your recipe is not like anything I’ve done with roast chicken so I can’t wait to try it! I came over from Amy and love this virtual dinner party y’all put on! We eat a lot of chicken, and I am always looking for new recipes. This sounds a-MAZ-ing! I bet it smells absolutely wonderful while it’s roasting. Your hubby should “guest-chef” on your blog more often! Thanks again for inviting me to be a part of your fabulous Fall Harvest Dinner! Recipe of the week! Looks legitimately good!! I will be looking for the biggest, plumpish chicken I can find. Many thanks to your Mr for this recipe. So many flavors and I know the kitchen smelled yummy. Thank you also for including me in the Fall Dinner. It was fun and I hope we can do it again. Wow! The flavor infused into your chicken must be incredible!!! Time for me to buy a roaster! I’d probably end up pulling all the skin off the chicken, eating that and not sharing it at all. But then, I’m selfish that way! This looks absolutely delicious! I’m excited to give it a try.